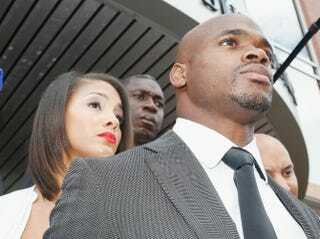 NFL player Adrian Peterson of the Minnesota Vikings waits with his wife, Ashley Brown, after making a court appearance at the Montgomery County Municipal Building Oct. 8, 2014, in Conroe, Texas. Peterson eventually pleaded no contest to misdemeanor reckless assault in a case involving his 4-year-old son. Friday ends the week but brings in a fresh start for Minnesota Vikings running back Adrian Peterson, who will be reinstated by the NFL as an active player, CNN reports. Peterson was first placed on an exempt list in September, which kept him off the field while keeping his paycheck intact. However, after he pleaded no contest to misdemeanor reckless assault (after initially being charged with felony child abuse) in a case involving his 4-year-old son, the NFL ultimately suspended him without pay. According to CNN, NFL Commissioner Roger Goodell told Peterson that his presence in the league depended on various requirements, including that he maintain “an ongoing program of counseling and treatment as recommended by medical advisers,” the NFL revealed Thursday. “Any further violation of the personal conduct policy by Peterson would result in additional discipline, which could include suspension without pay or banishment from the NFL,” the NFL added in its statement.